LG Chem (a battery manufacturer) is not square – no really, the company just announced they are breaking away from rectangular batteries. Those don't fit well into certain phone designs, like LG's own G2, which has a curved back. LG Chem has started production of curved batteries this month, which will power the next line of LG phones, but can also be used for smartwatches and smart glasses. 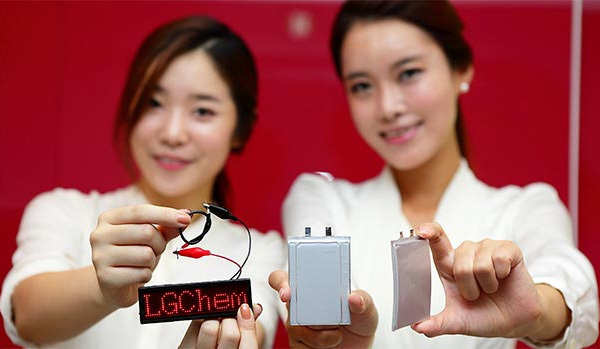 These batteries will work well with curved displays and LG's flexible displays. While it's not clear if the curved batteries will be able to bend like the display, the cable battery is much more versatile. As the name suggests, it's shaped like a cable and will continue to deliver power even if you tie it in a knot. This battery doesn’t heat up much and is water-resistant, which makes it perfect for wearable devices like smart watches and smart necklaces (still waiting on Kickstarter projects for this one). LG Chem is also positioning itself to be the top stepped battery maker - the LG G2 battery has a stepped design, meaning it's really two batteries stacked on top of each other to better fill out the internal volume of the phone (and give it an impressive 3,000mAh capacity, 16% more than a traditional battery). The Moto X (also with a curved back) uses a stepped LG Chem battery too. LG Chem has been making such batteries in its Nanjing plant since July. The company is aware of competitors also making stepped batteries and it's ready to take things to the next level with 3, 4 or more steps depending on the target device. LG Chem will be demonstrating these batteries and "related products in a private zone" on October 16.